Home / Events / SAMH Stomp! We are taking part in an event to help raise awareness of mental health, a cause close to our hearts. When we were asked to make custom hats for Frightened Rabbit, we were OVER THE MOON with excitement. It’s one of our proudest achievements as a small Scottish business because we love these guys. Frightened Rabbit have been a solid part of the soundtrack of our lives for the past 10 years. Their music has made us jump around, sing out loud and dance our socks off of so many occasions. Their lyrics have also made us think about life, learn to laugh at ourselves and cry a wee bit too. We are deeply saddened by the loss of the amazing talent that is Scott Hutchison. We want to support SAMH (Scottish Association for Mental Health) by doing this active and positive challenge. 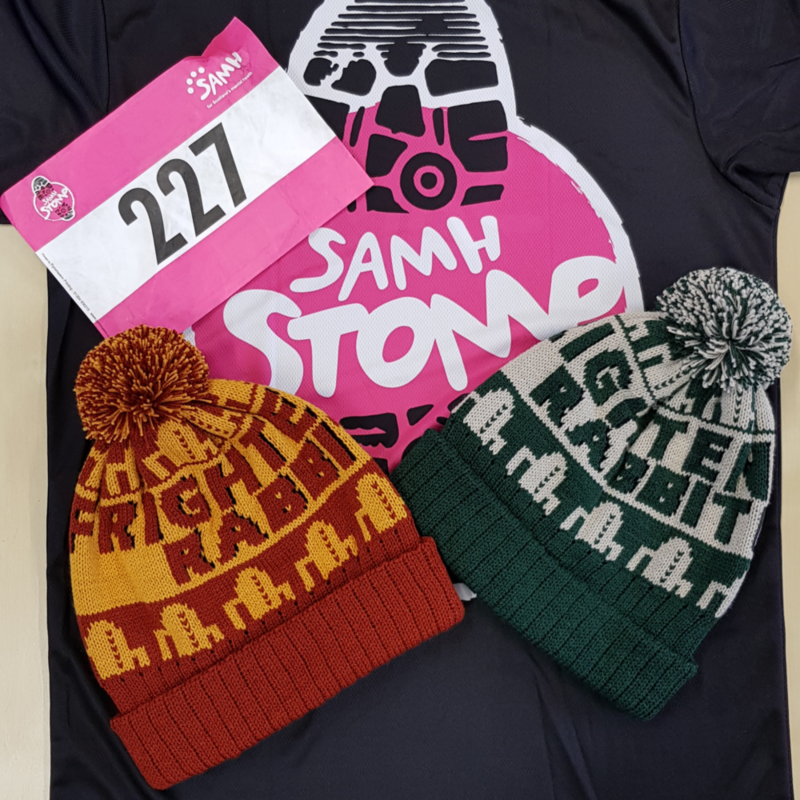 We’re climbing 4200 stairs in Murrayfield Stadium to raise awareness of mental health and generate funds to support SAMH. Your Frightened Rabbit hats are awesome and I would love to buy one but am not sure how to do this so hope you can help. Thanks for your comment, we’re really pleased you like the hats we made. Our team took part in the SAMH Stomp event in Murrayfield stadium in memory of Scott Hutchison. We made this batch of hats to help raise awareness of mental health, to get people talking about it. The profit from the hats went to support the work of the Scottish Association for Mental Health, a charity that Scott had worked alongside. Please keep an eye on our social media pages for news on our next campaign which will generate profit to support the Scott Hutchison Foundation.